P Chidambaram alleged that the "immediate goal of the government is to lay its hands on the reserves of the RBI and appropriate a sum of at least Rs one lakh crore to meet its fiscal deficit target and to increase spending in an election year". Laying hands on RBI reserves will have catastrophic economic consequences, P Chidamabaram warned. 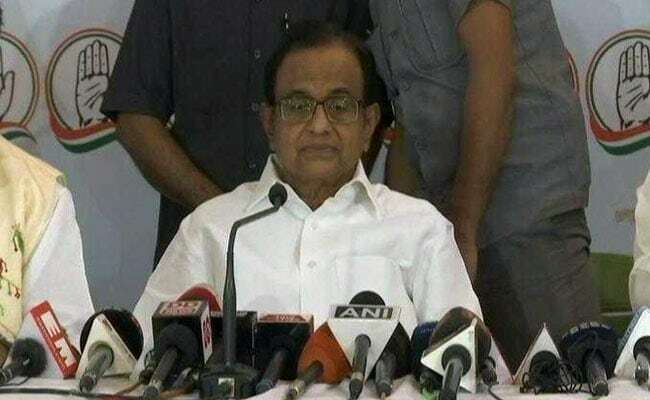 Former finance minister P Chidambaram today warned the NDA government against laying its hands on RBI reserves, saying it will have "catastrophic" economic consequences for the country. He also said the minutes of a Reserve Bank of India meeting on November 7, 2016 is a "comprehensive repudiation" of the government's "justification" for demonetisation. Talking to reporters in Guwahati, the senior Congress leader said it is clear that the BJP has no understanding of the role of the central bank and no respect for the independence of its governor. The government has already taken the "extraordinary step" of invoking Section 7 of the RBI Act (that empowers the government to issue directions to the RBI), he said. He alleged that the "immediate goal of the government is to lay its hands on the reserves of the RBI and appropriate a sum of at least Rs one lakh crore to meet its fiscal deficit target and to increase spending in an election year". He also said that "According to reports the BJP government is planning to override the RBI governor through the board of directors in which it has planted its hand-picked nominees". Taking to Twitter, he said the RBI Board had met on November 8, 2016 and "disagreed" with the key reasons given by the government, but "obediently endorsed demonetisation" and that was a "black day" in the central bank's history. Mr Chidambaram also hit out at the government over its claim to "fix appropriate economic capital framework of RBI" after it rejected as speculation reports that it was seeking the reserve bank's approval for release of Rs 3.6 lakh crore. "RBI minutes of 7-11-2016 is a comprehensive repudiation of government's "justification" for demonetisation. "RBI Board, with many members absent, met at 5.30 pm on 8-11-2016 and disagreed with the key reasons given by government, yet obediently endorsed demonetisation. That was a black day in RBI's history," he tweeted. He said that "shockingly, government's paper calculated GDP growth in real terms and growth in money circulation in nominal terms, yet compared the two and reached absurd conclusions. So much for the competence of the government." In Guwahati, Mr Chidambaram said he fears the worst at the next meeting of the RBI board on November 19. "I consider it my duty to warn the people of the country of the catastrophic consequences of the BJP government's ill-conceived actions." Asked if the RBI governor would resign over the standoff with the Centre if the central bank fund is transferred to the government through the resolution, Mr Chidambaram said "Either way - whether the governor resigns or the money is transferred - it will be disastrous".